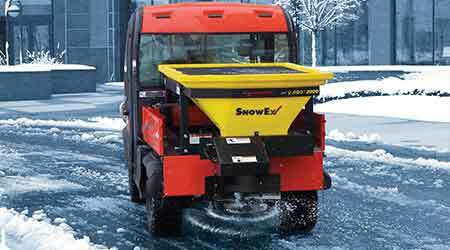 SnowEx introduces the new V-Pro 2000 bulk spreader, specifically designed to accommodate the bed dimensions of most UTVs. The V-Pro 2000 easily addresses applications where only a UTV can go, such as sidewalks, bike paths and driveways. The V-Pro 2000 has a multi-angled hopper, which can carry 11 cubic feet (880 pounds) of salt or sand/salt mixture and is designed for efficient material movement. This design creates a natural material vortex for maximum flow from the top of the hopper to the auger, helping prevent bridging and clogging. Its polyethylene construction contains numerous advantages over traditional steel-built V-boxes. Not only does the polyethylene help resist corrosion, but it also reduces the amount of weight added to the UTV. At 280 pounds, the V-Pro 2000 can be easily loaded or unloaded without any special equipment. Unlike other models on the market, the V-Pro 2000 features a quick-connect spinner drive assembly, which can be removed in seconds for easy access to the hitch. Competitors’ spreaders may require that the assembly be unbolted or that the entire spreader be removed before being able to tow. Using no engines, pulleys, sprockets, belts or chains, the V-Pro 2000 features an efficient direct drive system to the auger, which makes it very low maintenance and user-friendly. The cab-mounted dual variable-speed controller gives the operator full control over material flow and an adjustable spread pattern up to 30 feet. The V-Pro 2000 comes with a top screen that keeps large clumps of salt out of the hopper, and a fitted tarp. Optional accessories include a pre-wet liquid tank system.